Nacogdoches is a relaxing place to get away from it all, but don’t let the small-town atmosphere fool you. There’s always something going on, and some weekends your family may be hard-pressed to fit in all the activities. Here’s a month-by-month guide to the perfect Nacogdoches weekend. JANUARY Start your day off with a taste of history at the Old Fashioned Sweet Tooth Sugarcane event at the Durst-Taylor Historic House and Gardens, and then help cram the William R. Johnson Coliseum at a Lumberjacks or Ladyjacks basketball game. FEBRUARY It's a date! Take in one of SFA’s many cultural events, from intimate plays in the Downstage Theatre to touring productions sponsored by the College of Fine Arts. Grab dinner downtown and then catch a movie (or several) at the annual Nacogdoches Film Festival, or sip and stroll at the annual Downtown Wine Swirl. MARCH Nacogdoches really comes alive in the spring. Celebrate by perusing fresh produce and hand-made treats at the Nacogdoches Farmers' Market, and then spend a leisurely afternoon enjoying nature’s beauty along the Azalea Trail. Wrap up your perfect Saturday with a wild night at the Nacogdoches Pro Rodeo and Steer Show. APRIL There’s a whole lot of beauty to behold around town this month. Bring the family for a full morning of fun activities and entertainment at the Farmers’ Market Spring Fling, then pick up a few hard-to-find, “Texas tough” plants at the SFA Spring Garden Gala. Peruse the art at Texas National, an annual competition for American artists that is juried by an internationally acclaimed artist or critic. MAY During the first weekend of the month, enjoy authentic dishes from around the world at the Multicultural Fest at Sacred Heart Catholic Church. Then take advantage of the mild morning with a stroll through the SFA gardens to see the Sculpture for All Outdoor Exhibition and Competition. Or follow the Statue Trail to view the seven statues located downtown and along Mound St. to learn about influential people and events that helped shape the city’s history. JUNE Summer starts scrumptiously with the Texas Blueberry Festival, — the anchor event of a blueberry-sweet weekend full of activities in Nacogdoches! The Blueberry Bluegrass Concert in the Park sets a relaxing tone the night before in Festival Park. Downtown also plays host to the annual Juneteenth parade. As the temperature rises, keep the kids cool with a visit to Splash Kingdom Waterpark. 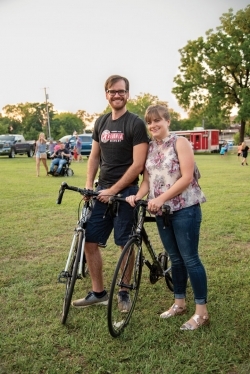 JULY Beat the heat by taking in a free movie at the Nacogdoches Public Library, or enjoy some live theater at the Stephen F. Austin State University School of Theatre’s SummerStage Festival. Make plans for a long weekend in Nacogdoches and celebrate Independence Day the old-fashioned way at Freedom Fest on July 4th in Festival Park. AUGUST Cool off with a dip in the clear, spring-fed pond at Camp Tonkawa Springs, a campground and RV park in Garrison, or beat the heat and sneak a little education into summer break by taking the kids to see a program at the SFA Planetarium. If it’s cool tunes you’re after, the PineKnot Music Coop puts on a free show at Millard’s Crossing on the last Friday of the month. SEPTEMBER It’s time for football, and that means it’s time for tailgating. SFA students, alumni and fans mingle around the Ag Pond before home games, and then pack Homer Bryce Stadium to cheer for the Lumberjacks. If you’re looking for a more soothing sound, the Sandyland Bluegrass Reunion features traditional bluegrass and gospel music, or the Sacul Folk Festival offers a full day of family fun you can tap your toes to! OCTOBER Fall means family-friendly fun in Nacogdoches. Enjoy the carnival rides, games, food and competitions at the Pineywoods Fair, and don’t miss the Ghosts of Millard’s Crossing, an annual event that finds a cast of spirits haunting the historic village, telling stories about their lives and handing out treats. NOVEMBER Enjoy the autumn leaves with a relaxing drive along the Fall Foliage Trail, go for a leisurely stroll downtown during the annual Downtown Art Walk or take a more strenuous trip around town during the East Texas Half Marathon.Get in the spirit of the season at Holiday in the Pines, a festive shopping extravaganza sponsored by Nacogdoches Junior Forum, International Fair Trade Market at Westminster Presbyterian Church and Wassail Fest, where downtown merchants feature their best holiday brew. DECEMBER Experience an Old Fashioned Christmas at Millard’s Crossing Historic Village. The Nine Flags Christmas Festival provides several weekends worth of activities, including the Jingle Bell Run 5K, a lighted parade downtown, a tour of homes, and so much more. It’s a non-stop celebration of the season that offers something for every member of the family.